Missy Franklin peaked at the optimal time in the 2012 Olympics. What do Michael Phelps and Missy Franklin have in common? World-class swimming talent, of course. At the 2012 Olympics, both were able to unleash peak performances on the biggest stage in the world. Coming up with your peak performance as a swimmer at exactly the right time depends on a successful tapering program. By significantly cutting down on the volume of your training swims, and adjusting the intensity and frequency of training as well, you'll rest your body sufficiently for optimal performance on race day. However, designing tapering programs is more art than science -- what works for one swimmer might not be the best approach for another. There's a growing body of research concerning the best approach to tapering for peak performance. 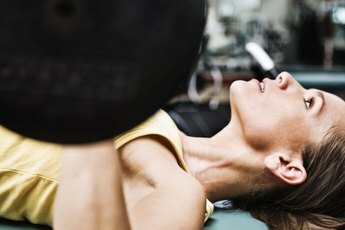 As the IDEA Health and Fitness Association explains, tapering has been shown to increase your muscle glycogen level, increase muscle strength and power and increase your maximum power output. If the taper period is successful, you'll retain all of the benefits of your regular training routine while allowing the accumulated fatigue of all that training to diminish. Tapering periods can vary from roughly one to four weeks. If you taper for too long, the benefits of regular training start to diminish, and you'll experience a de-training effect that will make peak performance impossible. The key to a successful taper is to dramatically reduce your amount of training by 60 to 90 percent. According to research published by the American College of Sports Medicine, such volume reduction results in minimizing accumulated fatigue and enhancing the physiological and psychological attributes necessary for peak performance. While you won't workout as frequently during a taper, cutting back drastically on the number of workouts will result in a loss of swimming power in as little as a week, according to research cited at the Peak Performance website. Experts advocate a 20 to 50 percent reduction in the number of workouts during the tapering period. Swimmers who drastically cut back in the frequency of their workouts report losing a "good feel for the water," which seems to be necessary for peak performance. Cutting back only slightly on the intensity of workouts is the best approach to tapering. Interval work at about 90 percent of normal intensity seems to produce optimal results. Not only are Intense swims necessary to avoid a de-training effect, researchers theorize that interval training combined with a reduction in training volume might provide a unique stimulus to the muscle system that leads to peak performance. Determining the optimal tapering schedule for each individual involves trial-and-error. By working with your coach, you can experiment with different tapering periods while adjusting the volume, frequency and intensity of your workouts. The benefits of tapering can improve your performance at important meets by as much as 6 percent, according the American College of Sports Medicine.